While fireworks go off behind them, Thai civil servants hold up candles and chant Long Live the King during the celebration of the King's Birthday on Sanam Luang Thursday night. December 5 is the birthday of Bhumibol Adulyadej, the King of Thailand. This year marked his 86th birthday. 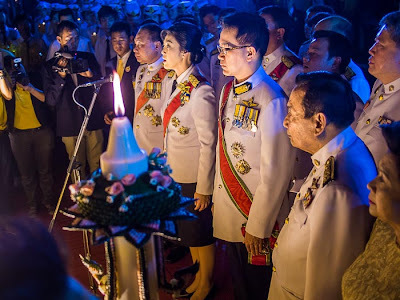 The King has been at his palace in Hua Hin since August, he hosted a special birthday public audience there this year. His birthday is probably the most important non religious public holiday of the year in Thailand. The King is widely revered throughout Thailand. His portrait hangs in almost every home and public building in the Kingdom. At this time of year, there are shrines for the King in front most of the larger buildings and people routinely stop to write holiday greetings for His Majesty. 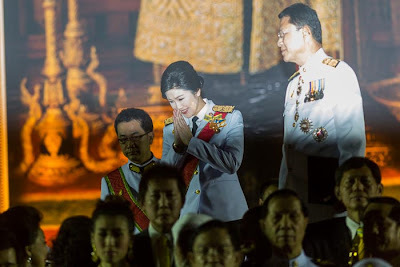 Prime Minister Yingluck Shinawatra "wais" coming into the celebration of the King's Birthday (top photo), with other members of her government (bottom photo). 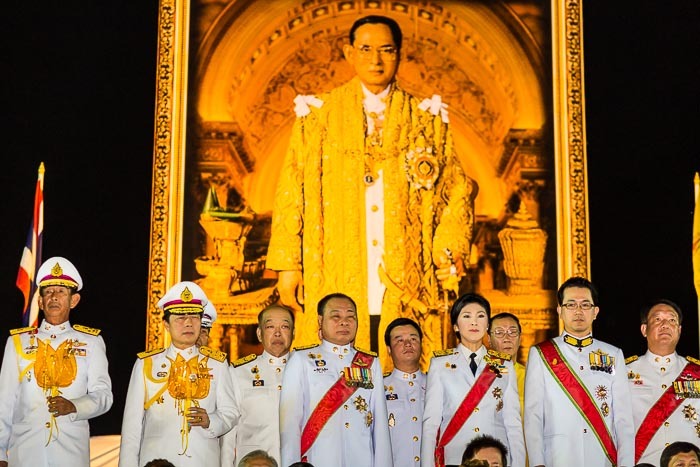 Thailand is a constitutional monarchy and the King doesn't wield much official power. But he still commands great respect and admiration from the Thais, so his public statements can have enormous implications. He hasn't commented publicly on the current political crisis gripping Thailand but in the past he has stepped in to prevent bloodshed between protestors and the military, most famously in 1973 when he opened the gates of Chitralda Palace, the Royal Family's residential palace, to shelter students who were being attacked by the army and again in 1992 when he summoned military commanders and civilian protestors to his palace and urged them to seek a peaceful solution to a political dispute that had turned violent. The 1992 incident, in particular, is frequently seen as a deciding moment on Thailand's road to democracy. Prime Minister Yingluck (center) reads a proclamation during the King's Birthday. In his younger years, the King was quite a bon viviant. He's an accomplished jazz musician, patron of the arts and a respected amateur photographer. The King has been very involved in economic development projects throughout Thailand and promotes his own form of sustainable development. His influence is felt in almost every part of Thai life. 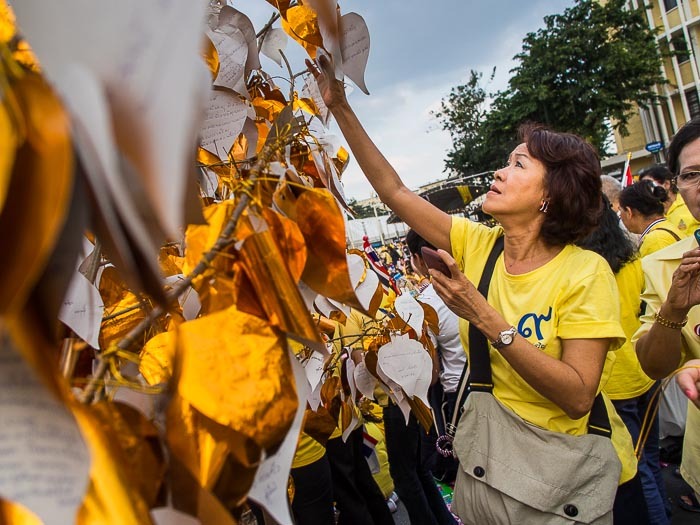 A woman leaves birthday greetings for His Majesty on a replica bodhi tree in Bangkok. It's hard for Americans, who have no history of Royalism or Monarchy, to understand the role the King plays in Thailand. It's something that transcends party politics and religion. In his younger days, he traveled throughout Thailand meeting rural villagers and peasants, talking with them about their lives and their problems. He funded the construction of dams and water reclamation efforts throughout Thailand. As he's aged, he's cut back on his travel and doesn't get out of Bangkok much. But he's still seen as a unifying figure and much loved by the people of Thailand. 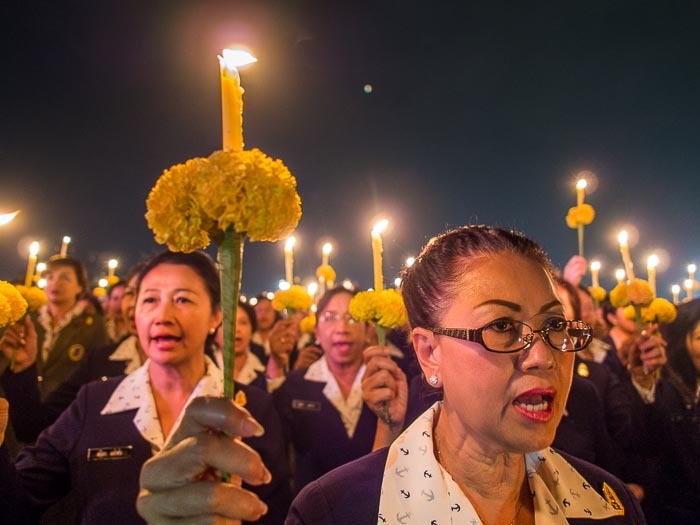 People hold candles above their heads at the close of the candle lighting ceremony on Sanam Luang. I've photographed royal events a couple of times (but never the King - that's not allowed for protocol reasons). Every time I am moved by the love the Thais show for their Monarch. 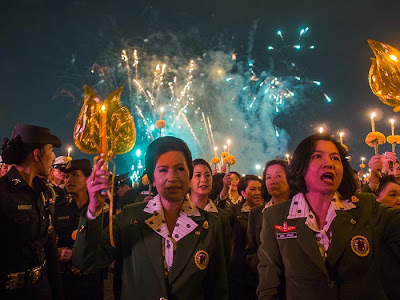 There are more photos of the King's Birthday in my archive or available from ZUMA Press.